During the program "We solve problems of the client in a new way" in January-February 2011 were realized two major activities that solved a number of important tasks for Leacond Company, authorized trading partner of Daikin Corporation in Ukraine. On January 25, 2011 we held a press lunch about results of the contest "Fresh mind 2010” for the best article on the topic of “air conditioning, ventilation, creating a climate". This contest continues for 7 years, and is the most lasting contest on the Ukrainian media market. The main group of tasks, which have been solved with the help of this contest for several years lies in the field of media relations which includes keeping in touch with a pool of specialized journalists and promotion the theme "air conditioning, ventilation, creating a climate” in the media, as well as attracting the media's attention to this subject. The image photo session shoot of top-management of Leacond was held at the end of February. 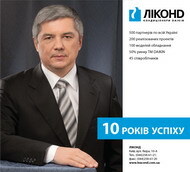 This traditional activity was intended to update the visual component of the promotion program of the company, which celebrated its 10th anniversary in 2011. Regular photo and video set updating is a very important factor in the successful PR of any company. It is worth to note that all clients of Publicity Creating have a visual component in the promotion program now - different video clips and photo-picture stories.